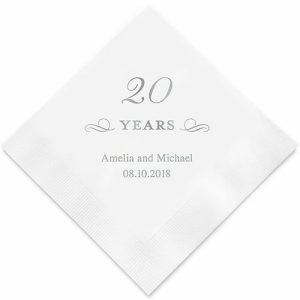 Personalized wedding napkins are anything but boring. Besides being a great way to incorporate your personal touch at low cost they can also complement the table’s decor. 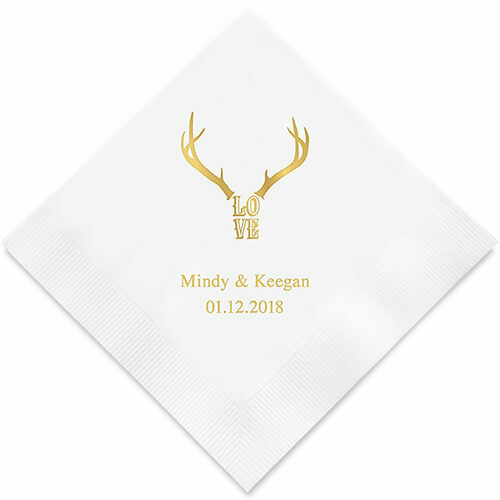 In fact, anything related to your wedding theme can be incorporated into the napkin design. 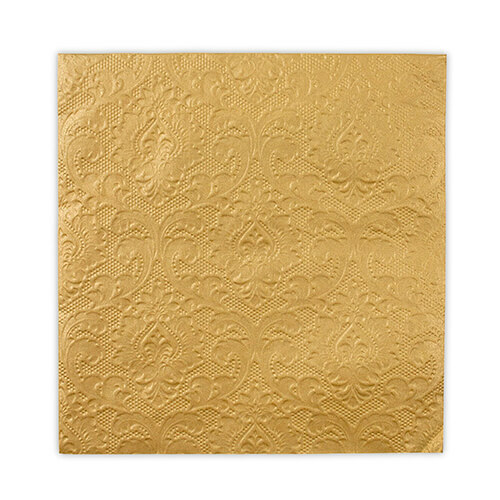 Select a custom gold or silver foil lettering to add style to your napkins like. Moreover, pick a unique shade like metallic pink, blue, purple and more. Other customizations: handwritten text style, monogram, spouses name, seasonal detail, etc. That are many ways to set the tone for a wonderful wedding day. 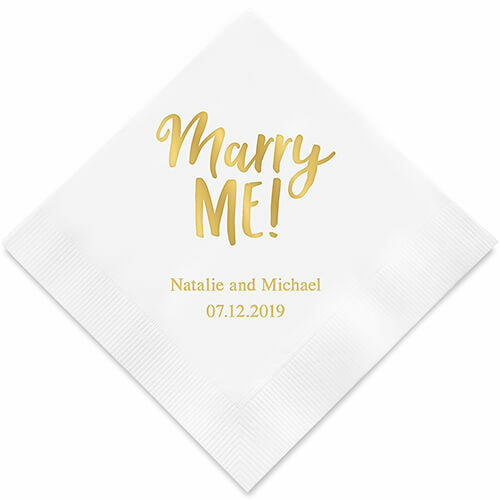 Choosing to have personalized wedding napkins is certainly one of them. The reason for this is that you can turn a plain white napkin into a statement of style and strong commitment. The best part, it’s an affordable way to achieve it. Also, there is a myriad of designs and customizations available for all occasions making it easy to have a distinctive and elegant looking table decor. Never underestimate the impact of a small detail. This is especially true when the object is both functional and personalized with the recipient name. In fact, the napkins can be personalized with your guest’s name serving as place cards. 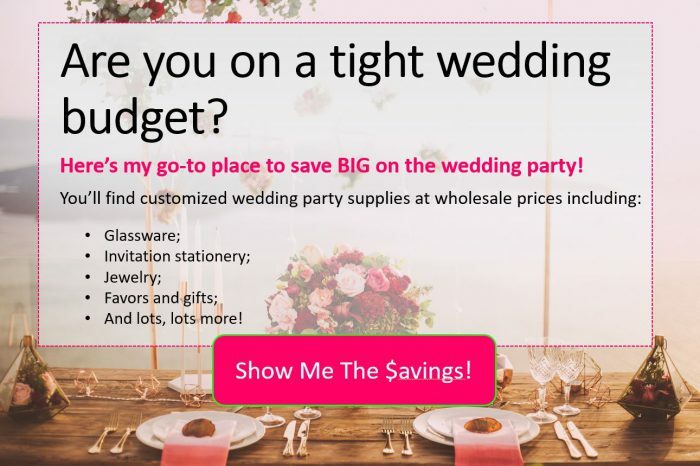 You can also add a symbol, quote or any type of design link to your theme idea that best represents your wedding theme. Then, pick appropriate colors or patterns and you turn a simple napkin into a harmonious table decor element. Vintage style reflects old fashion elegance and provides lots of romanticism. 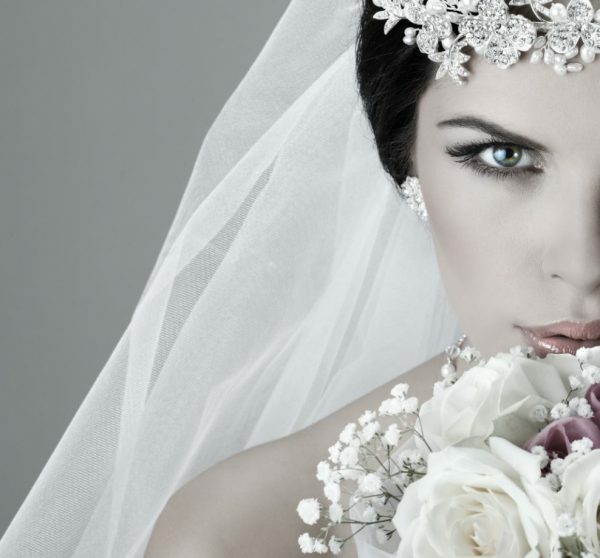 This is why many people choose a vintage theme for their wedding. For example, mint green, lavender purple, blush pink and antique gold are beautiful colors and are also great options for your paper napkins. If you already picked your accent colors choosing neutral colors like gray and ivory are best to make them stand out. Finally, there are many pretty vintage patterns printed on napkins as well. A floral and damask design will provide a nice contrasting touch without looking overwhelming as it would on a tablecloth. 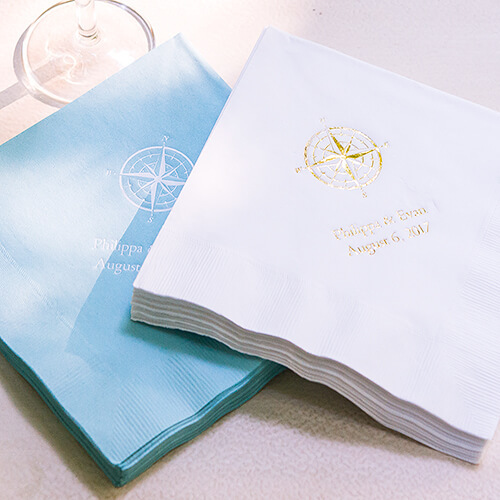 Adventure lovers will appreciate a delicate compass design on their napkin. However, they will be thrilled by a napkin folded into an airplane shape! 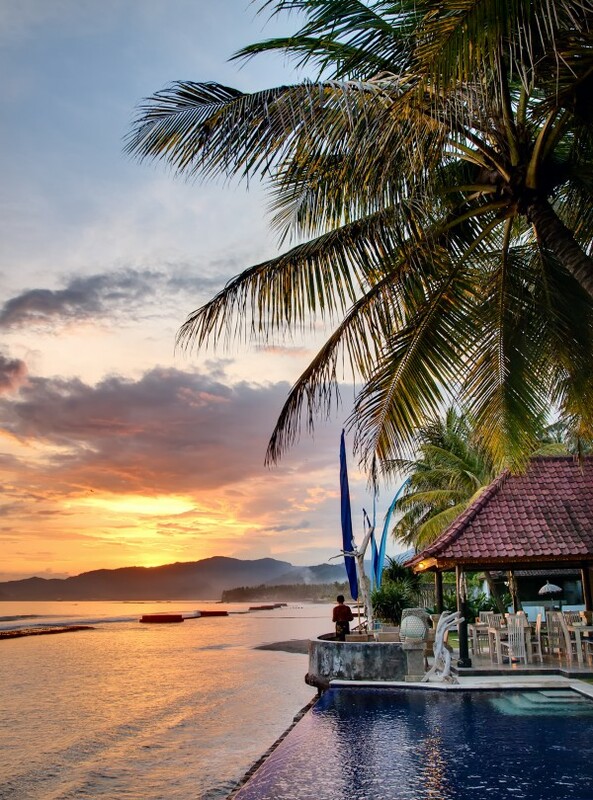 After all, travel is about discovering new routes and ways of doing things. Also, don’t hesitate to dig deeper into the subject and add a design that underlines your travel interest. It can be golf trips, visiting island beaches, tasting foreign gastronomy or embarking on cruises. It can be as simple as a wine bottle or vine grape design that underlines your passion for visiting vineyards. Pick an animal print like zebra or giraffe for your napkins for a cheerful and stunning looking napkin. Whatever your interest, your guests will enjoy this personal touch. Country weddings are informal and heartwarming celebrations. Unlike weddings where etiquette is followed to the letter, the respective bride’s and groom’s families and friends are invited to”pick a seat, not a side”. Interestingly, rustic and shabby chic weddings are in the same welcoming spirit. Therefore choosing a tartan, floral, woodgrain or lace pattern for your napkins adds a humble and delicate touch. Some objects are often associated with country style weddings like mason jars, antlers, cowboy boots/hat, barn house, a wheat sheaf, etc. One way to personalize the napkins is to have one of these country-like items printed on your napkins with the spouse’s name or monogram. Try also to pick a design that represents you as a couple. It can be as simple as a flower design. If you love horses than a horse silhouette or horseshoe is a design you can relate to. Tropical and nautical elements are often used together to decorate a beach wedding theme. Bird of paradise flowers, palm leaves, and exotic fruits are only some ways to represent a tropical theme wedding. These symbols are pretty generic and you can make them more personal as well. 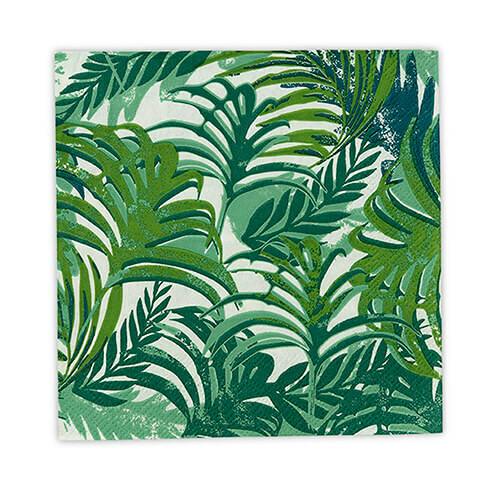 For example, if you love Hawaiian islands than personalize your wedding napkins with a hibiscus print. Do you enjoy surfing the waves? A surfboard design customized with your favorite quote is a perfect choice. On the other hand, if you want something as simple a solid color napkin with a stylish monogram than go for it. Tropical latitudes are known to have lush landscapes. Pick a fuschia, lime green or turquoise color napkin that resembles the vibrant colored flowers found in those idyllic places. 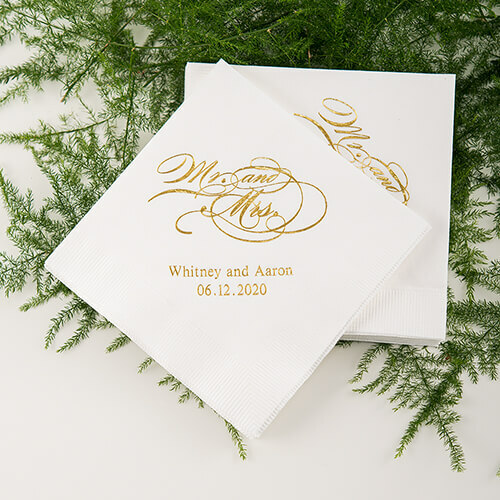 Your personalized wedding napkins become a treat for your guest’s eyes! 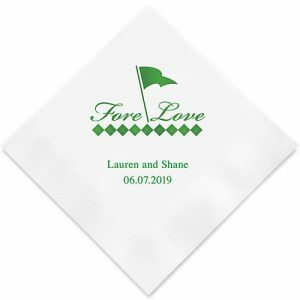 Personalized wedding napkins are available in many sizes to fit the different needs. Small paper serviettes have a folded size of 12.06cm x 12.06cm. These are the perfect size for beverages, toasties, and bites during cocktail. Your guests will also appreciate them during the evening celebration while having a drink at the bar or at the dessert buffet. The typical square napkin is the perfect size to fit all needs. It can be used for the dinner and can also be used to make creative folding masterpieces. In fact, there are many ways to fold paper napkins and make them look amazingly unique. Some folding techniques are really simple and will provide a nice structural look to your table setup. These 10.8cm x 20cm rectangle shape napkins are sophisticated and will complement your wedding guests table decor in the most exquisite way. In fact, just the shape of it adds a lot of decorum when placed over the dinner plates instead. 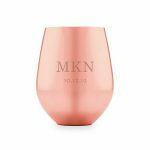 Imagine how lovely these look with a personalized message or a monogram! 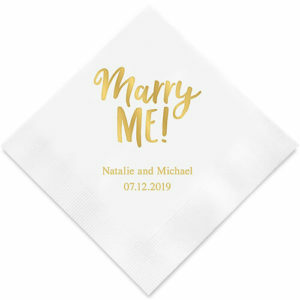 As you can see there are various ideas, themes and models to make your paper napkins a hit at your wedding, engagements party, shower and much more. 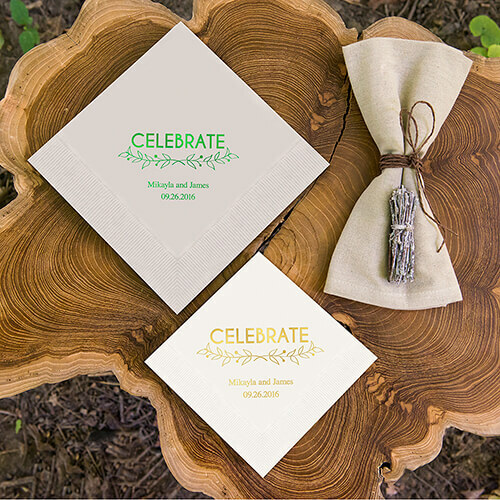 The most important benefit of choosing paper made over fabric made personalized wedding napkins is the price. As a matter of fact, a customized embroidered fabric is more expensive than a printed napkin. Also, you won’t need to hide them under the cutlery as you would with a plain white napkin. In fact, it’s the opposite, show them off! Pick your favorite color and design and have fun finding a creative way to set them off to their advantage.